I am moving posts over from my Herb Garden site, which will be going away once I complete the task. 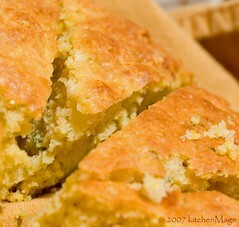 This cornbread recipe is from a few years back. but it is one I regularly return to. I hope that you enjoy it as much as I do. As the days shorten and temperatures take a nightly dive, my food cravings begin to turn towards fall's hearty soup and stew offerings. It's not that I am done with summer – there are still lots of tomatoes on the counter and the herb garden is bursting with late summer goodness – it's more that I feel the need to diversify a bit. Hedge my bets against the day the sun doesn't shine so brightly. Maybe it goes with the simmering pot of blueberry habenero chutney, another sure sign of fall, or perhaps it's just absence making the heart grow fonder, but the other night I found myself pulling a container of someoneElse's chili out of the freezer. A brief digression may be called for here. Around our place, there are several levels of heat in food: warm, hot, hot+, hot++, and georgeHot. The latter refers not to George Clooney but rather is named for a friend who likes really hot stuff – a high point of one of George's recent vacations was discovering a tourist shop in a small Washington town with a shelf full of one of his favorite hot sauces from New Zealand...on sale. someoneElse has been working on making something so hot that George is satisfied. Said satisfaction may involve post-tasting skin grafts on his tongue. I, unfortunately, get sideswiped by incorrectly labeled things on occasion. This chili said hot+, I swear. Where was I? Oh yes, chili...freezer. The plan was simple: chili, salad, bread. A quick and easy dinner that could expand to include the friend who called from the road and was invited to join us. I was a happy mage. Except that the month of the broken oven (now over, thank the flying spaghetti monster!) left me with darned little in the way of bread in the house. Nothing, actually. Checking the clock, I realized that all I had time for was some sort of quick bread. Chili...quick bread...it must be cornbread! As the only part of the meal I could claim to have worked on, though, the cornbread had to be special. A peek in the refrigerator uncovered feta cheese. I can work with that. Google "quick bread" + feta and I see this sentence: "Cornbread is a quick bread." Thinking, "Ah, cornbread, with a reference to feta somewhere - that must be a sign" I clicked on the link. Kevin's Cheese Bread. Um, err, is that my site? Just a couple of weeks ago, I wrote that there was a "distinct nip in the air and a slight crunch to the grass. Fall was creeping in on little cat feet." Um yeah, whatever. What a difference a fortnight makes. Can you say 129 mph winds, boys and girls? How about 3 inches of rain in six hours? I knew you could. Along with the overnight shift in seasons comes a shift in menus. Grills have been stored for the winter while tomatoes and basil have given way to winter squash and sage. Mmmmm! I love fall! It is all about warm comfort food around my house. One of the year-long herbs in my garden is rosemary, which I love paired with olive oil and a bit of salt. All three flavors come through in these deeply flavorful, yet delicate, cracker that I am sure to be making many variations in the months to come. Let's call this Weekend Herb Blogging, because it still is the weekend and I haven't played a meme all week. Kayln's got interesting herbs collected on her blog every weekend, do go check out this week's offerings. 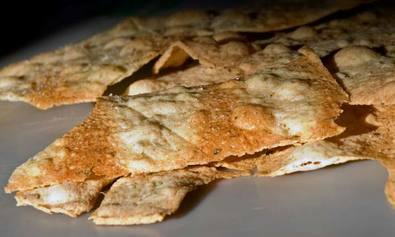 These crackers were inspired by a combination of things: the flavor profile was derived from a recipe for Herbed Olive Oil Crackers from Jerry Traunfeld's The Herbfarm Cookbook, the addition of yeast was due to a recent batch of Lavash from The Breadbaker's Apprentice, and the use of the pasta machine comes from a recent conversation with Farmgirl.